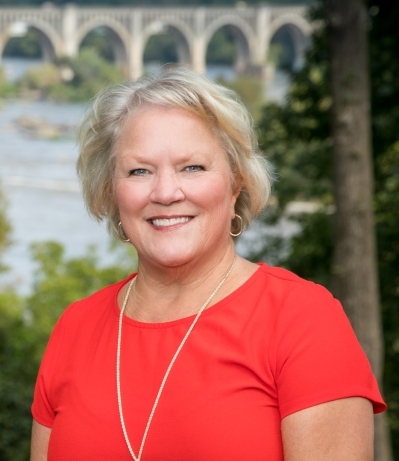 Meg Traynham is an experienced Realtor® with Long & Foster in Richmond, Virginia who will have you feeling like family in no time. 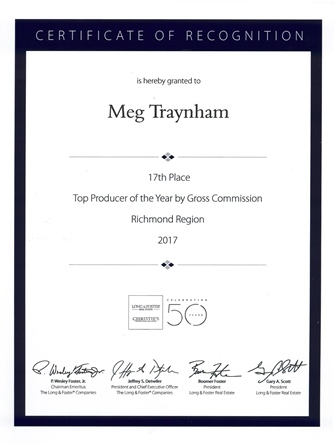 Years of working and living in Richmond has given Meg a unique and valuable perspective on a variety of neighborhoods and "all things Richmond" for a diverse clientele. Other than a brief stint in Raleigh as a newlywed, Meg has called Richmond home most of her life. Meg's comprehensive analysis of your home buying and selling needs prioritizes your comfort and ensures that your experience is as warm and personal as it is seamless. Her straightforward and honest approach lends itself to an efficient process, and her sharp negotiation skills are unusually productive in resulting in the best values and sales prices for clients on both sides of the transaction. Developing a personal relationship with clients is one of Meg’s strengths, a quality that takes the potential stress out of selling and buying your home. Built primarily on referrals, many of Meg’s clients become lasting friends. When Meg is not meeting with clients and showing homes in the Richmond area, you can find her visiting her daughter and son-in-law in Chicago, her son and daughter-in-law in Washington, D.C., enjoying a meal with her husband at one of Richmond’s many delicious restaurants, or just hanging out with her beloved rescue dog, Darby. She has been married 35 years to her college sweetheart, loves antiquing and bargain hunting, and is an avid sports fan, especially when it comes to college football, ACC basketball, and swimming. Looking for a pleasant, personal, and professional Real Estate experience in the Richmond area? Call Meg today, she would like to add you to the list of her happy clients! Beautiful renovation with a modern vibe nestled amid an acre of gorgeous landscaping within minutes to downtown! HUGE eat in kitchen boasts custom cabinets, high end appliances and gas cooking, gorgeous baths w/ heated floors, and beautiful tilework throughout the home. Private Master Suite is amazing with gorgeous luxury bath featuring cherry cabinets, oversized glass shower, and 3 closets! Yard with iron fence keeps animals in and workshop/shed provides great space for the hobbyist. Banquet sized dining room with fireplace is great for entertaining, imagine holiday meals in front of inviting warm fire! No worries during hurricane or ice storms...the WHOLE HOUSE gas generator will keep your household moving right along...thermopane replacement windows, dimensional shingle roof, paved driveway are just a few more of the bonus features you will find in this turnkey home. "Meg was awesome! We have bought and sold 3 houses with her! We LOVE her!" "Our realtor, Meg Traynham had the knowledge and experience we needed. As first time buyers, we were especially grateful for Meg’s expert guidance and negotiation skills. She was referred to us by a friend, and we are so glad we met her! We will not hesitate to choose Meg and Long and Foster again if the need arises." "Meg helped us with staging and sold our home in less than a week in a tough market. She then found the perfect home for us the first day it came on the market. We can’t say enough about her warmth,professionalism and straight forwardness. We have refereed several friends who have also been very happy with her service."